Why children should be encouraged to outdoor sports? Nowadays, computer games or even a high technology gadgets like mobile phones, are the most recognized and highly expensive form of entertainment. Kids today do more indoor activities like sit in front of their computer and play their favorite games. You must encourage them to do outdoor sports activities like basketball, soccer, baseball and alike and help them to enhance their physical attributes. That’s why kids today are more prone to illness because they are not exposed to different outdoor activities. Kids which apply outdoor sports have more energy and are physically fit because they were able to exercise and burn their calories. 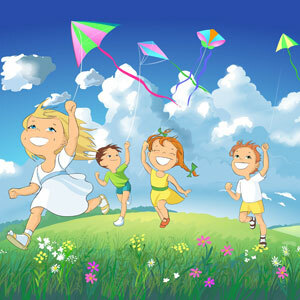 They are more energetic and are far from getting sickness because if their daily outdoor activities. This is more important in order to fight and avoid childhood obesity. An outdoor sport is beneficial to the kids because they get lots of fresh air and their body is fully began. Outdoor sport can boost our immune systems. Sunlight also stimulates the pineal gland which regulates our body clock and is a very important factor in upgrading our kid’s immune system. They become physically, mentally, and emotionally strong. It can also help the kids to develop self-control and improve health conditions such as Attention Deficit Hyperactivity Disorder (ADHD). Their parents on the other hand, want them to improve themselves confidence. Outdoor activities like skating, running and playing sports could develop kid’s muscle and would result to good body coordination. Even if kid just play on slide and swing in the playground, their sense of balance, rhythm and timing will also be developed. Kids can build self-confidence through these activities by mastering a challenging activity like skate boarding, or becoming skillful in sports like basketball or baseball. The child develops his sense of achievement and will not be frightened to attempt hard tasks. Having an outdoor activity also provides the opportunity to discover and explore new things, which can also give themselves confidence to try to observe new things. In reality more than 70% percent of young kids would like to participate in sports activities and quit during the age of 12. Unluckily, there are signs that this percentage may continue to build up, resulting in an even more settled lifestyle. As parents, it is our responsibility to encourage our children to be active in different sports activities. Eliminate all the negative aspect on your kids and try to explain them the advantages of having these kinds of activities. Playing with gadgets is not a bad idea but try to explain them the good effects if they will engage themselves in sports. You can play with him to strengthen your bond as parent and child. By doing so, you are creating a harmonious and exciting relationship with your kid. You see that your children have no more sign of on-field performance. Practices are not being organized because they are always tired. Many children are sitting on the bench with no eagerness to play. 15% percent chance to get outrage at youth games or practices. 70% percent chance that your child will not continue to join team sports by the time they reach at the age of 12. Youth sports have become an outstanding stage for adult enjoyment and achievement. Either to release their childhood experiences or to omit previous athletic embarrassment, some parents hope that their children will excel in their abilities and skills exposure. Get involved, rather than waiting on the side just watching and doing nothing. Try to become a dedicated and committed instructor or a coach to them. Create a child’s league with some parents for them to be able to be active in sports as well as building harmonious relationship with other teammates. In this way, you will also meet other parents and build good relations with them. Collect the right tools to be able to teach one or two skills within a well organized plan for the whole season. You will become a resourceful person for your child. Try helping them on how to impose a better and more response for everyone. Kids will be motivated if they see all the necessary things are available to learn the sport. Conduct a league practice and forget any tradition. Rather than managing a single team practices, make a scheduling on your child’s league whether during a day or evening in each week and provide them a very simple rules and instructions that can be easily understood by them. As a parent volunteer, you can participate with other parents and must be willing to coach specific and basic fundamentals of sports. Let your kids decide also. Individual and creativity are not from traditional organized activities. Another reason kids will easily get dissatisfied and drop out is because they are not given the chance to create and manage their own games or work on their skills for their own development. If kids are happy, then parents are also happy. The most important role of a parent is to coach and to teach and make them ready as players for an event competition. Enable kids and coach them to conduct their own game abilities. You will be proudly witnessing your child taking on his or her responsibility. As a coach, you have the capacity of educate the game properly. There is no need for you to watch close by during every game. Take a functional role as a coach during games and instruct a positive game plan. Demonstrate a parent characteristic. But most parents find themselves frustrated with their own child's sports proficiency. Group all team parents together and talk it over for any concerns. Trust one person to sit down with the coach to discuss the game plan. This will produce feedback to the coach and open a communication that will avoids future disagreement. Sports have many advantages especially for our kids. As parents, we are responsible of encouraging them to engage and get themselves involved in it not only to be physically fit but also to develop sportsmanship between the kids.